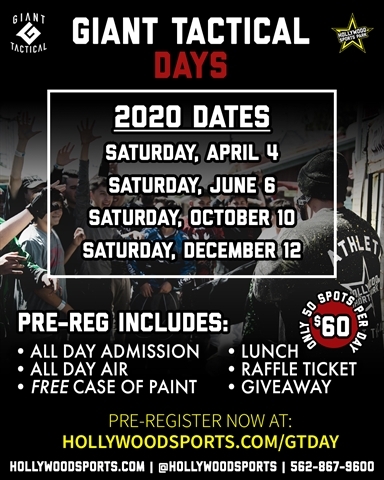 $60.00 per player, each player gets: LUNCH, 1 CASE OF PAINTBALLS, ALL DAY AIR, ALL DAY ADMISSION, RENTAL GUN, RENTAL MASK, FREE GIVEAWAY, 1 RAFFLE TICKET, PRIVATE GAMES ALL DAY. Available on March 17, May 26, November 17, 2019 ONLY. Group Duration: All Day (Giant Tactical Group Private Games) ADDITIONAL INFORMATION: Field Paintballs Only. No Outside Paintballs Allowed. Players must be at least 10 years old to play.